The 2019 application is now available online! Please contact Amelia at 603-847-3371 or amelia@applehill.org with any questions. Applications are accepted on a rolling basis until May 1, 2019. We are still accepting applications for sessions I, II, III, and IV. If you are interested in attending session V, please contact Amelia about our waitlist today. The non-refundable $75 application fee, paid by credit card online or by mailing a check to Apple Hill Center, PO Box 217, Sullivan, NH 03445. Application fee waived for applications received by December 17, 2018. A placement recording. Apple Hill encourages musicians of all skill levels, and admissions are considered according to availability. When selecting the sessions you are applying for, please make sure you are available from 5pm on the first date listed until 5pm on the last day listed (plus any necessary travel time); we cannot accommodate late arrivals or early departures. Contact Amelia (amelia@applehill.org or 603-847-3371) for any questions about travel arrangements. If you are applying for financial aid, please make sure to fill out all financial aid questions thoroughly; we cannot evaluate incomplete applications. Label disc with your full name, identifying information about the piece, and your instrument/part. Applicants applying on two instruments must send a complete set of placement recordings for each instrument. Placement recordings are not auditions; they allow us to make the best possible music assignments for you this summer. Once Apple Hill has received your application form, application fee, and recording, your acceptance letter will be mailed to you. Once you receive your letter, you will need to send in your tuition payment and required forms. New Hampshire state law requires all participants to submit a health history, health statement, and immunization record; above is our suggested form. Any medical costs incurred during the time of camp will be billed to the camper or the camper’s parent/guardian. In the case of serious illness or medical emergency, the advice of a physician will be followed. In such an instance, a representative from Apple Hill’s summer staff will contact the primary parent or guardian as soon as possible. Completed 2019 Emergency Contact and Release Form. You can read our summer policies here. The $75 application fee is waived for applications received before this date. Applicants who complete their application, are accepted, and pay the tuition deposit by this date will receive a $100 tuition discount. January 15, 2019 — Application deadline for Fellowship Program. See below for more information. February 1, 2019 – Work study (Camp Director, Counselor Worker, and Teaching Assistant) applications due. See below for more information. May 1, 2019 – All applications must be submitted by this date, including the form, fee, and placement recording. Medical, travel, and emergency/contact forms completed and sent. 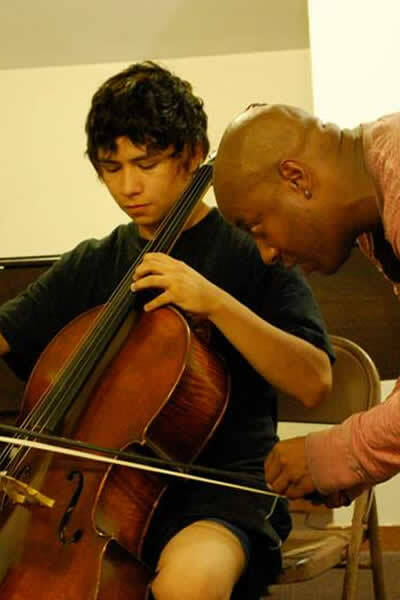 May 17, 2019 – Chamber music assignments posted online. If you currently play in a trio, quartet, or quintet, we encourage your whole group to attend an Apple Hill session together. These groups will be coached one period each day, and individuals in these groups will also be mixed into new ensembles with other members of the participant community. To apply, each group member must apply individually. List the names of your group members under the “music requests” portion of the application. Please also send a group placement recording, to include at least one work played by the group, in addition to individual placement recordings. Please note: Occasionally in very full sessions, smaller pre-formed groups may be incorporated into larger groups; for example, a pre-formed piano trio may become a piano quartet or quintet with the addition of other musicians. In those instances, pre-formed group members will still be assigned a group together. Please contact Amelia at 603-847-3371 or amelia@applehill.org for more information. Work study positions are available for returning participants over age 18. To learn about and apply for Apple Hill’s Fellowship Program, click here. If you have additional questions, please click here for FAQs, or contact Amelia at (603) 847-3371 or amelia@applehill.org.